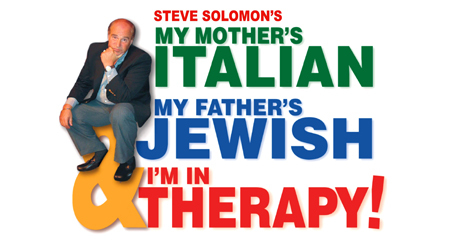 My Mother’s Italian, My Father’s Jewish & I’m In Therapy is Steve Solomon’s smash hit comedy inspired by his hilarious family and all the people in his life whose sole purpose is to drive him into therapy… and they succeeded. One part lasagna, one part kreplach and two parts prozac, you don’t have to be Jewish or Italian to love this show. All you need is to know what it feels like to leave a family dinner with heartburn & a headache!